The Edelmann is a very special typewriter. This linear index machine with a Blickensderfer-like typewheel had no less than four consecutive manufacturers (two in Berlin and two in Frankfurt) until it went off the market in the late 1910s. Characters were selected on the Edelmann by shifting the index pointer along the linear index on the front of the machine. A simple system of cogs would turn the typewheel into position. Inking was done with ink rolls that are visible in pics 5 and 6. Selection for capitals and figures was done with two keys on the left of the machine. The third key was for spacing. The typewheel was intentionally placed relatively high above the platen, so that it could be slammed with considerable force onto the platen, which was useful for the production of duplicates and stencils. Because production continued into the years of the first World War, the last manufacturer (Julius Pintsch of Frankfurt) decided that the construction could also be used by disabled typists. If necessary, the selection and printing could be done with a stump or even an elbow. The only problems were the shift keys and the carriage return, for which two hands were needed. And so the company produced a special table with treadles to operate the space and shift keys and the carriage return. 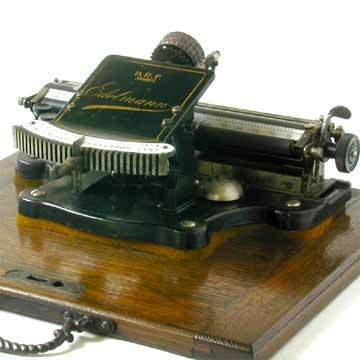 The typewriter itself reportedly cost 125 marks in 1914. With the table for disabled typists, the machine cost 400 marks.